Produced by an outstanding team of filmmakers, including the Boston Globe's Pulitzer Prize-winning environment reporter, David Abel, SACRED COD gives us an up close look at the challenges many will have to face in the age of climate change. Other films by David Abel and Andy Laub are Lobster War and Gladesmen: The Last of the Sawgrass Cowboys. "Perfectly captures the relationships between policy makers, scientists, fishermen, and humanity...A wonderful educational tool that provides and fosters many opportunities for critical thinking in providing solutions for dichotomous relationships." "A powerful, beautiful film that shows the multifaceted aspects of the fishery for this iconic species...The lessons in this documentary extend well beyond the focal region and species. It illustrates how our traditions and life choices color our perspective and collide with what is determined by scientists, managers and policy makers." "Thoroughly researched, reasoned and surprisingly moving." "Sacred Cod shows us the human and ecological costs caused by New England's ignoring obvious signs of ecological decline over the past four decades. The filmmaker's depiction of fractured families, disrupted communities, and decimated cod stocks demands that we do better. If ever a documentary revealed how closely tied humanity is to the ecosystem on which we rely, this is it." "[An] intelligent and necessary documentary...Provides a perfect entry point into a discussion of the tragedy of the commons, climate change, American history, and economics. A valuable resource for both the brain and the heart." "Sacred Cod impressively captures the complexities of managing this vital natural resource in a changing environment. It gives insight into the sometimes-contentious ways that science, policy, and politics interact when both environmental goods and human livelihoods are at stake. This is a compelling case study for any class involving fisheries or natural resource management." "Sacred Cod does a fantastic job compressing the extremely complex and complicated issue of the New England cod fishery into a captivating and enjoyable one hour...A powerful educational tool...I teach undergraduate courses on fisheries policy and marine conservation, which are heavily based on developing critical thinking, and I look forward to showing this documentary to my students." 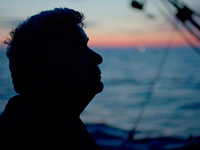 "The film does a good job of capturing the tension of the different stakeholders in a declining fishery, and it highlights well the disconnect between the 'big picture' stock assessments and the 'local view' of coastal fishers in the western part of the Gulf of Maine." "Sacred Cod will be useful in general environmental management or marine environmental management courses to introduce students to the interrelationships between the marine biological and human aspects of managing the Gulf of Maine fishery. This film should be shown in courses dealing with resource management." "The film breaks my heart as an American and infuriates me as a scientist. The legacy of ignoring scientific advice for decades is the complete destruction of our cultural heritage. I will definitely use this thought-provoking film in my fisheries management classes." "Highly Recommended...A must have for all courses about fisheries, environmental management, and the Tragedy of the Commons. For any courses studying the scientific, political, or cultural impacts of the Atlantic cod fishery this is an essential purchase. No other documentary or television program is available as a substitution about cod fisheries...Recommended for campus and community film series." "If you like documentaries that make you feel for people on every side of the story - regulators, scientists, fishermen, local government officials, the guy who runs the ice factory - Sacred Cod is for you." "Highly personal and emotional...Useful for students studying the environmental effects of changes in climate, unregulated fishing, and the man-made consequences for those depending on a single source for their livelihoods."